Lewis vs dos Santos to headline UFC on ESPN+ 4. The UFC is gearing up for a Heavyweight showdown between Derrick "The Black Beast" Lewis and Junior "Cigano" dos Santos at the UFC Wichita event on ESPN+ in March. According to MMAJunkie, Lewis vs dos Santos will headline UFC on ESPN+ 4, taking place March 9 at INTRUST Bank Arena in Wichita, Kansas. Lewis (21-6, 1 NC) is currently ranked second in the Heavyweight division, having won nine of his last 11 fights including wins against Alexander Volkov, Francis Ngannou, Travis Browne and Roy Nelson. In Lewis' most recent bout at UFC 230, which came just weeks after his KO victory over Volkov, he tapped out to Heavyweight champion Daniel Cormier in the second round. 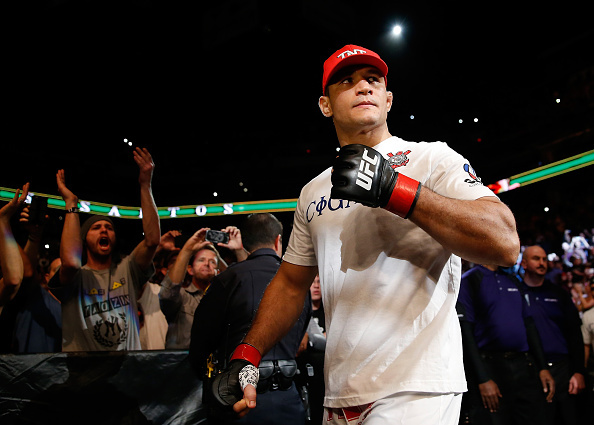 His opponent, Junior dos Santos has won three of his last four fights, and two straight since he was cleared of potential anti-doping suspension, when it was revealed a supplement maker he used was producing products tainted with a performance-enhancer, according to MMA Junkie. Dos Santos defeated Tai Tuivasa by way of second round TKO in his last bout at UFC Fight Night 149. For his UFC career, he boasts a record of 14-4. UFC will kick off their partnership with ESPN on Saturday January 19. The UFC on ESPN+ 1 event, taking place at the Barclays Center in Brooklyn, is headlined by a superfight between bantamweight champion TJ Dillashaw vs flyweight champ Henry Cejudo, for Cejudo's title. Other matches include former NFL lineman Greg Hardy vs Allen Crowder, Paige VanZant vs Rachael Ostovich, and Gregor Gillespie vs Yancy Medeiros.